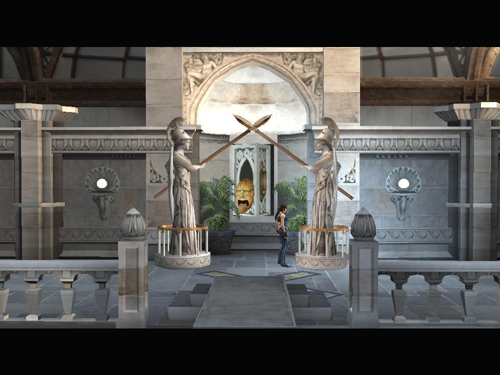 Go to the two large statues flanking the center alcove and turn them inward so they face each other. This rotates the panel in the alcove, revealing another golden switch. 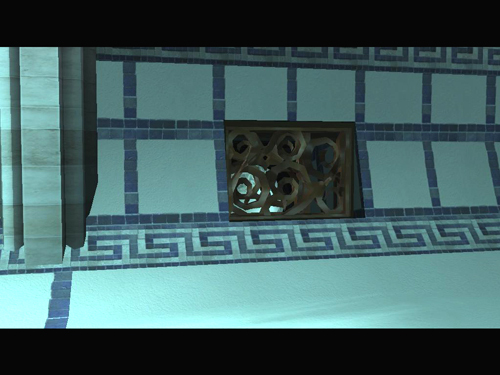 Use it to open one of the 2 grates blocking the underwater passage in the pool. 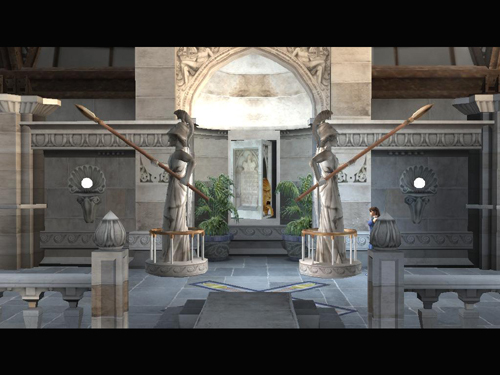 Now turn the 2 statues again to face away from each other, as instructed by the first plaque, in the SECRET PASSAGE off the LIBRARY. 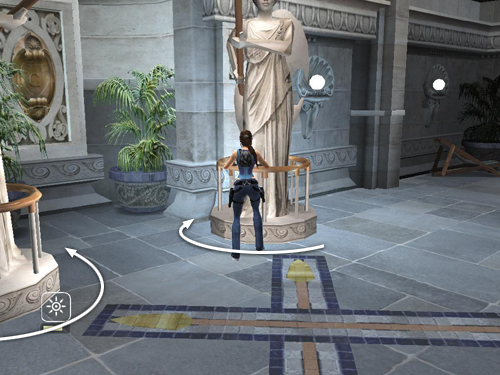 NOTE: In order for this to work, you must have actually read the first plaque, by approaching it and pressing Interact to make Lara read the words aloud. The gold switch turns into the wall, revealing a second plaque. 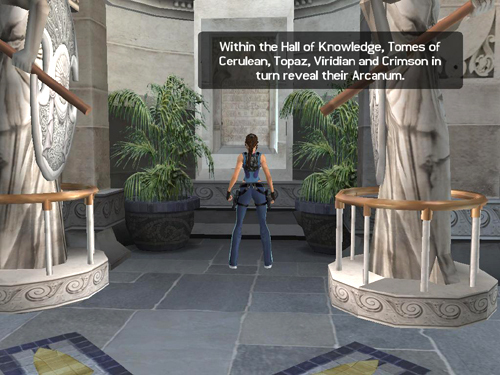 Approach it and press Interact to read the inscription: "Within the hall of knowledge, tomes of cerulean, topaz, viridian and crimson in turn reveal their arcanum." This is another clue to the gold reward. 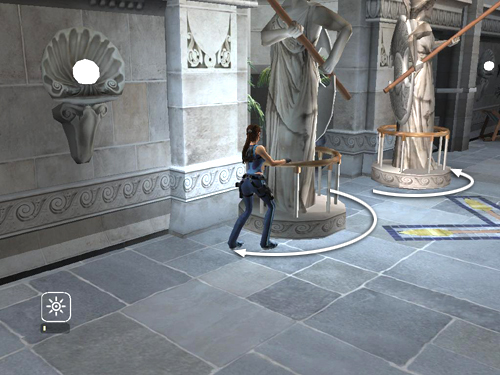 IMPORTANT: A few players have reported a bug in which they obtained the gold reward first then returned to the swimming pool, only to find they were unable to turn the statues inward again to reveal the golden switch that opens the underwater grate. I have not been able to reproduce this bug. 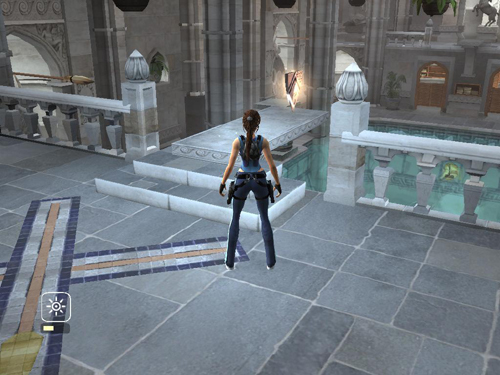 It may only occur if you quit Croft Manor and return at a later time, but just to be safe, I recommend using the switch and reading the plaque during the same visit to the swimming pool. ADDITION: Advis reports that installing the version 1.1 patch (only for the European version of the game) fixed this bug. Thanks, Advis!